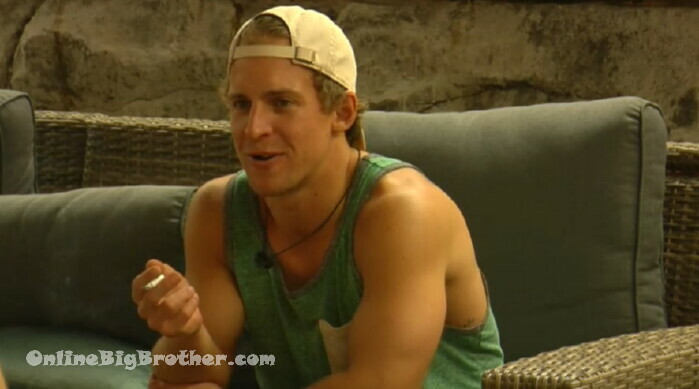 Big Brother Spoilers – Dane wins the power of Veto. He will be using it on himself and Sam will be the replacement nomination. 12am Hot Tub room. Mark, Dane, Damien, Kyra, Adam and Sam chatting about random things. 1:30pm The house guests start getting ready for bed. 1:38pm HOH room. Cory and Dane. Cory – I am so excited! Dane – I am so happy! Cory – this is going to be epic and insane! Dane – I am so happy! Hey, the universe wanted this to happen because right when I came out there I was like Pppfff! This is the challenge?! You know why the universe lined up? We got our picks, he (Adam) didn’t get to play because if he had played it would have been a bigger battle. But right when I came out .. I was like no one is beating me. We’re executing this f**king plan. Cory – so do you think Esti has any play. She is putting on a pretty good facade. Dane – she is coming up to me .. saying I am happy you won but I can’t leave this week. She was like who do you think Cory is putting up? I said I don’t know. Cory isn’t telling me sh*t. I was the target so why is she going to tell me stuff?! Cory – Yup, HHmmhhmm. And did you know .. the holes.. I won’t give you the details but.. I am finding holes in Kyra’s story and Sam’s story. And they’ve given up on telling me things. I have no idea what they’re doing right now. Dane – they were so happy … and now look at them. Cory tells Dane about how Sam came to talk to her and used her (Cory’s) own words to describe what she (Cory) was doing. Dane – she thinks she is so persuading and manipulating. Cory – everyone is going up to Anthony. You know who did come up to me? Adam. Cory – I just have to think about how I am going to word it. I think I will end with a real good zinger. Dane – I am going to build up to your speech. Let you do the finisher. Adam needs to be sent packing! What a puts! Yes, Sam melt down here we come! Who is the lil siddler Kyra going lurk around now once Sam gets the boot? Lovin, the closeup of HER brushing her teeth….That’s gonna leave a mark. I don’t like Kyra either, but blatantly using the pronoun “her” because you know they want be called they, is disrespectful. 1) on cue, once their lies and ratfink behavior become questioned, kyra is back to blaming mental health and pms. 2) este is once again a boylliance denier. well… of all the women, este had the hardest time believing their was one so maybe i shouldn’t be surprised. 3) how much of a surprise is the pov ceremony going to be when cory and anthony are neon sign hinting? 4) sam beginning to blame adam for sam lying. it was all to cover adam’s tracks? like the hoh would have nothing to do with a back door plan? 5) cory spending so much time getting to the bottom of a plot deemed so insignificant that the editing department cut it out of the episodes. she needs to be thinking the hoh, the pov holder, and the blood veto holder didn’t make a move to evict her, so maybe there’s someone or something more insidious happening… that she’d just be told is a figment of her imagination anyway… and she’d believe was imaginary… or. never mind. the whole someone’s going to do something to change the season trajectory ship sailed. hit an iceberg. sank. 6) the ego tripping. strategically i don’t have any issue whatsoever with the prettyboys. if you are playing the game with a bunch of lemmings willing to jump off a cliff, it makes sense to watch them jump. but being egotistical about conning a bunch of bobbleheads getting shots from d/r every time they do something stupid like it’s the biggest achievement ever? nu-uh. 7) trying to figure out how the next episode arc is going to tie to the last one. there has been an awful lot of significant plot left on the cutting room floor, and a lot of narrator driven misdirection. narration calls it ‘great dane’s (ed. not so great) prettyboys’ and pushes the theory that dane is was and always will be the driving force of that alliance. dane’s idea was one ride or die. a beavis to his butthead. only smarter. it was adam that dreamed of a 4 man brolliance. adam. the one getting the anything for love edit since week three. 8) we’re into part two of the three part plan mark. any time now. put your money and horrific dance skills where your mouth is. and btw, admitting now that you had a thing for kiki? nobody needed to know that. i get the feeling mark believes he is getting more air time than he is. Basically, my answer is no – I don’t see how Sam gets out of being evicted. Too many things need to happen for her to stay. The main factor is she won’t have the votes. Anthony earmarked Sam as his priority boot weeks ago & Dane also wants her out so that’s three votes (b/c Cory is tied to Anthony, plus she’s not going to nominate Sam just to save her – if she were going to do that then she’d put up Kyra). That leaves Damian/Mark (both have better relationships with Este), Kyra & Adam for votes. Even Kyra/Adam aren’t givens b/c Anthony will push Kyra into believing Sam threw her UTB & he’ll want her to vote his way to prove her loyalty. Ditto for Adam – voting for Sam (especially when Dane didn’t for Kiki) will push him to the bottom of the PB totem pole. If it as a different week (or quicker turnaround like a DE or TE) I could see Adam getting Mark on board, but it’s more likely Mark will use this to build concert with him for later in the game (see previous post & Mark’s plans for triple eviction). * Whether you buy it or not Dane has committed to Anthony/Cory to go F3 whereas Anthony prob doesn’t even fall top 3 on Adam’s list so it’s an easy choice to keep Este over Sam. The only way I can envision Sam staying is by getting someone else put up. For that to occur it would require Sam to know beforehand she was the intended target & then doing something drastic to switch Cory’s focus. READ: find a way to get Adam to out the PBs & either admit it to Cory or have Cory overhear the admission. All week we heard about the “blind side” that’s coming – imagine if that ended up being Cory putting up Anthony lol. Yeah — it won’t happen. Anyway, that’s my two cents – Sam goes up, tells Cory she lied to protect Adam (which he’ll confirm) then she’ll try to throw Este UTB or out the guys & all of it will blow up in her face. Bottom line, Sam had an opportunity to change the direction of the game last week – she didn’t and she’ll pay for it with her BB life.